Cap: an irregularly fan shaped bracketbroadly attached to its substrate; 20 - 80 mm diameter; upper surface smooth but often very irregular, radially striate, but also often bumpy;cream topale brown coloured. Pores: off white to pale brown; hexagonal and radially elongated; < 1 pore per mm; pore surface is honeycomb like. Flesh: hard, woody, pale brown. 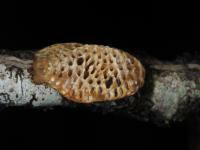 Notes: This fungus is recognized in the field by its large elongated hexagonal pores which look like a wasp's nest or honeycomb.There seems to be some confusion as to whether H. vesparia and H. apiaria are synonyms.